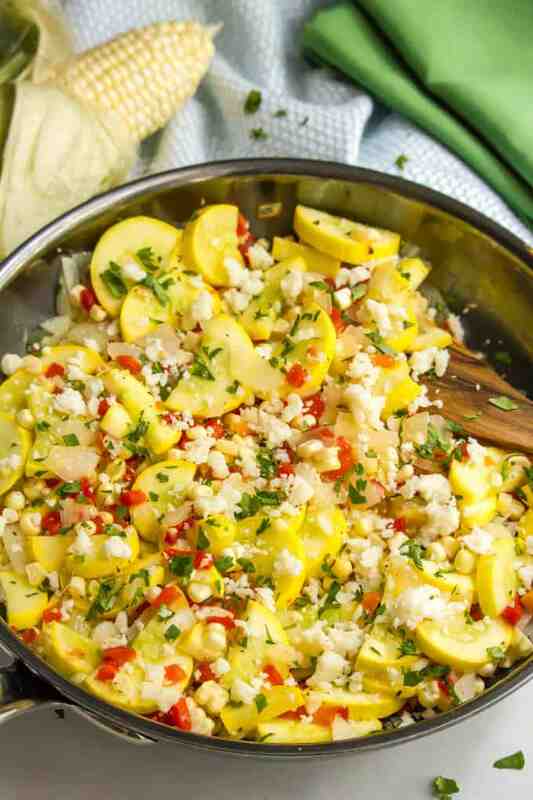 Yellow squash and corn medley is a flavorful one-skillet side dish that’s a celebration of fresh summer vegetables! We had a fun weekend at our local amusement park, some pool time, plenty of movie nights and lots of good eats! Sigh… maybe next year it’ll go a little better?! 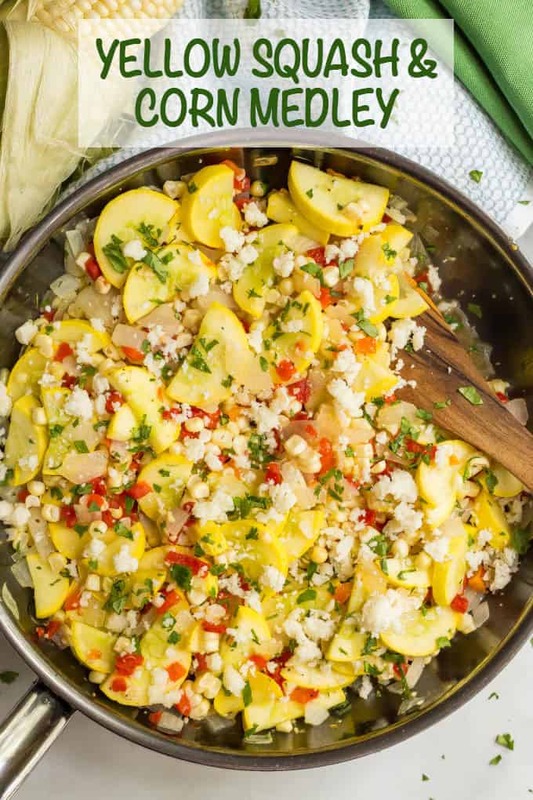 Regardless, today I’m celebrating some of the freshness of the season with this yellow squash and corn medley. 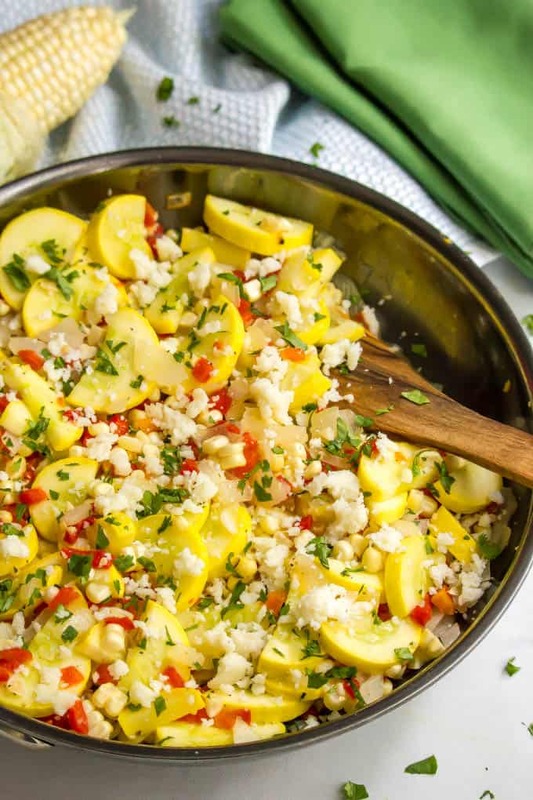 It’s an easy one-skillet side dish with plenty of fresh summer squash, sweet corn kernels and a pop of color from the pimientos. I’ve included ideas for some combinations in the notes below and in the notes with the recipe card to get you started. 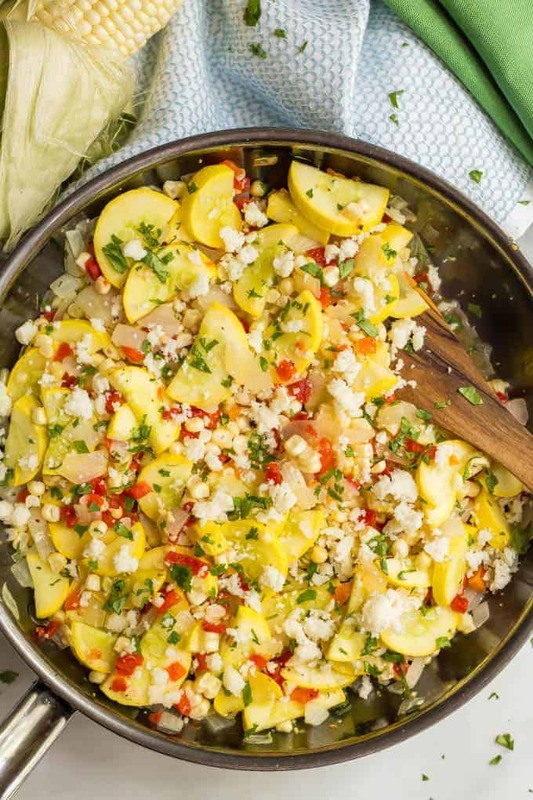 However you go with the finishing touches though, I think you’ll love all the fresh flavors and the summer vibes in this side dish! As I mentioned, there are several options for the cheese and herb topping. Here I’ve used crumbled queso fresco and fresh cilantro. 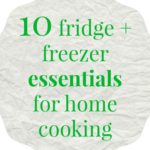 It’s great for a hint of Mexican flavors. 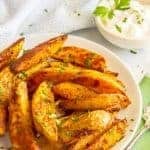 Other great combinations: fresh basil and grated or shaved Parmesan; basil with crumbled feta cheese, fresh parsley and Parmesan or parsley and feta. Feel free to get creative and come up with your own favorite combo too! Heat oil in a large skillet over medium heat. 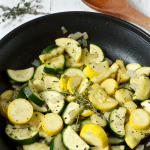 Add onion and squash and sauté until tender, about 4-5 minutes. Add the corn and pimientos and stir to heat through for 1-2 minutes. Serve hot topped with desired combo of cheese and herbs (see notes). There are several options for the cheese and herb topping. 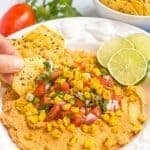 Here I’ve used crumbled queso fresco and fresh cilantro. 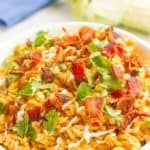 It’s great for a hint of Mexican flavors. 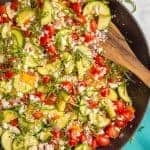 Other great combinations: fresh basil and grated or shaved Parmesan; basil with crumbled feta cheese, fresh parsley and Parmesan or parsley and feta.